I really am remarkable. I’m quite proud of myself. It’s not in my nature to feel or say something like that, but then again, I’ve never been in my nature. Nonetheless, I have come to a threshold, a quiet moment of reflection. This is a petit mort of no return; a mad moment where I can sit in the eye of a cyclone and calmly observe the howling winds from a place of stillness and solitude. Not a hair on my head is touched. I can relax for a bit. This moment of solitude is a natural part of the process. Several days ago, I released my hounds. The ball is in play. The barrel has gone over the falls. There is no way to stop it. In a minute, I will need to leave the eye and walk back into the hurricane. All artists have been there. The paint is dry. There is no time for revisions. You make peace with God. The show has to be hung. My screw is a bit looser. Over several pressured years, the 24/7 work schedule has pummeled me into a very vulnerable, obsessed state. Obsession is one of those concepts that are hard to comprehend unless you’re standing in the boiling water and nervously liking it. The voodoo sneaks up on you. 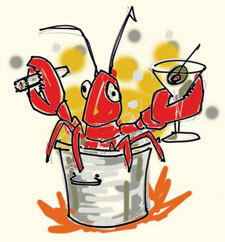 Obsession boils its lobsters slowly, always starting with a cool pool. The piece is about finding Joy and Beauty in all things. How wonderful is that? To accomplish this feat, I required a specialized team of technically trained artisans with a wide range of talents, from html coding to pottery glazes to cocktail mixology, costume design and photography tricks. The project required a lean budget of $1.5 million. I needed to find a patsy. I required someone who is gullible and easily led, yet one who can make a decision and complete a task. Someone smart enough to learn programming but dumb enough to obey. I needed a gung-ho, rah-rah type who’d work for free. Pathologically idealistic. A patriot. A revolutionary. One who would abandon all in the name of the cause. A Craigslist ad provided few leads. I was forced to recruit myself. Like an ugly slavemaster with a bullwhip, I worked myself hard. The long drive has brought out the best and worst of me. Always a loner, I’m afraid the isolation has turned me into a lost man with a cache of arms, a foil beanie and reams of tightly penciled pages. I can barely talk to anybody anymore. Lately when I speak, common words are uttered unnaturally, as if I have been without human contact for a thousand fortnights. Me, Dingo. I have always been unafraid to fight for an idea or a principle. As a temper, I had the good sense to pick my battles wisely. Now I no longer assess risk. I’m the kamikaze who just shoved the control stick forward bringing the plane into a dive. The velocity increases. The screaming wind shrieks an octave higher. Adrenalin rallies a “Bonzai!” Glory is mine and the heavens shall open. My work habits used to be seasoned and balanced, like American management. Every hour, I would stretch the limbs and pepper my lungs. Today I live like a frantic bodybuilder who needs to add sixty pounds of mean muscle in four days. Steak, chocolate cake and anabolics. In this moment of reflection, in the eye of the hurricane, I wonder what the future will bring. Will the champagne cork fly high into the starry blue? Or will it pop and smack me in the eye? For once I don’t worry about either outcome. In the moment of battle I am fueled by these dreams and nightmares of possibility. Each, in its opposing way, stokes the fires and combusts the engine. To glory! To victory! To success and acclaim! Champagne and passed hors’ d’oeuvre! On the other hand, to defeat with integrity! To a beautiful death! However Luck may swing, to a job well done! Beans and a forty-ounce! This fourth show can effectively end an art series that I really adore. I like making it. I have fun. Should nothing come of it, I will carefully wrap the project for storage as a young widow folds a wedding dress. I will document all of the elements and produce an eleven-piece limited-edition book, a scrapbook to eulogize the effort. I will place a copy on a bookshelf of prominence and hide the others in a box in the attic. I’ll have to scramble to take a job, one I probably won’t like. Then I will need half a decade to pay off the debt that the project has bled. To do this, I will have to remain hermit’d and alone because people cost money. Pleasures will be few. This misery will surely produce an addiction to something unbecoming. In time, I will start to diddle and draw. A new series of work will slowly emerge and again I will follow that journey to its inevitability. I did my very best and I gave this effort my heart and soul. I shall find solace and acceptance in the fact that God looks out for artists, drunks and fools. Someday, against a golden sunset, a fresh art school grad will sit in an Echo Park café and excitedly tell his comrades of a treasure trove that he found in the attic of the ruin that they’re squatting in. Found are ten copies, all produced back in Twenty-Ten. The colored pages required a leather spine five inches thick. Words. Images. Ideas. Maybe it’s a discovery! Maybe it’s worth something! Over coffee, they will think of the maybes. On the other hand, the fourth show could mark a new beginning. If it gets some play, my hunch would prove correct and the blood loss would be justified. According to plan, it would support a whole new artistic and philosophical effort in a variety of media applications to an ever-expanding audience. The cosmology would be allowed to flower, revealing a highly intricate web of purpose, comfort and universal relevance. According to plan, the work would do nothing less than change the way humanity looks at Life. The phenomenon would actually evolve our species. According to plan, the work would become a portal to the new Age of Aquarius. Personally, it would give me the escape pod that I need to survive. Buried deep in an abandoned subway tunnel of my mind, I have been building a craft, a self-contained and self-sustaining galleon that would afford incredible speed and brilliant light. The polymorphic arc is an artist’s toy chest of unlimited resources manned by a skilled and eager crew. I can do as I please, dependent upon no one. I can make anything I wish, regardless of demand and function. I can fly.